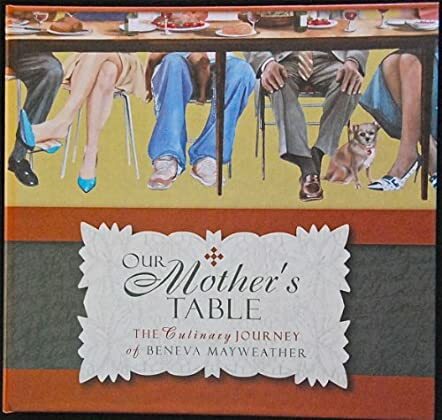 Our Mother’s Table, the Culinary Journey of Beneva Bone Mayweather, by Emma Mayweather Lincoln and Denise Simms, is a family cookbook. It’s dedicated to their mother and it also details the interesting history of their mother and how she became a caterer. Beneva Bone and her family were dairy farmers and also cotton farmers. As a child in Arkansas in the 1930s and '40s, she picked cotton endlessly in the summer for the market. There are many recipes traditional to the South - baked beans, fried chicken, cheese straws, and buttermilk biscuits - but there are some upscale items as well which may be common to the South. Our Mother’s Table is a very attractive book; hardcover with concealed spiral binding, with a homey looking graphic on the front and back covers showing a table laden with good food. All you see of the people sitting at it are their legs, feet, and some of their hands. There is also a small dog under the table to add to the hominess! For the most part, one recipe takes one page, with a wide decorative margin. Recipes are grouped in various categories. There’s Thanksgiving Dinner, there is “Down Home,” and “At Home on Provine Street” which are, I imagine, all the recipes they enjoyed at home while growing up. Other sections include Elegant Entertaining and Southern Hospitality for the most characteristic recipes. There is even a section for Wild Game Hunters including pheasant, turkey, and quail. Lincoln and Simms have put together a good quality memorial to their mother. All in all, this is a very enjoyable read and I will be trying several of these recipes in the near future. "Our Mother's Table: is a beautifully presented collection of recipes from a woman who loved her family, and loved food. The cover is especially engaging as you can well imagine family and friends gathered around the table enjoying a feast prepared with love. The recipes reflect the warm hospitality of Southern living and the graciousness of the many and varied occasions that highlight day to day life in the South. I have had the privilege of enjoying many of these dishes and I can say the food will leave you longing for more and more. I am grateful to have this book as part of my collection. I reach for it often, especially when I want to touch someone's heart.